Please don't tell me to take a bath. No, a scented candle is not going to help. I do yoga already. I can't afford to "get away." I "take time for myself." All the stress is still there. You see, my house revolves around stress. It's the very essence of our family. Always has been. Right now, I'm dealing with a kid on probation who apparently has NO desire whatsoever to move forward in his life in a positive manner. Whenever I hear a news story about teens being arrested in a break-in, or being involved in an accident, or some other terrible story, I think, "That could be my kid." It might very well be my kid one of these days. "Lay down the law" you say. It's been done. We're now at the point where we will have to legally evict him from our house if he chooses not to follow the rules. Can you imagine my mother's heart the day that happens? Shattered. H has all the support in the world. His family, his extended family, friends, church community. But he continues to make poor choices. And I watch. And stress. I feel weak, and sick. Helpless. Sad. Angry. Hurt. Betrayed. No bath with candles and soft music is going to help. I'm praying incessantly, but of course, it is all up to the kid. He's the one who has to want to change and then change. Oh, I'm calm. 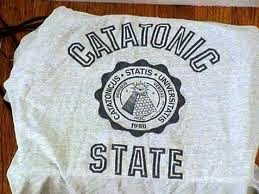 No, I'm catatonic.